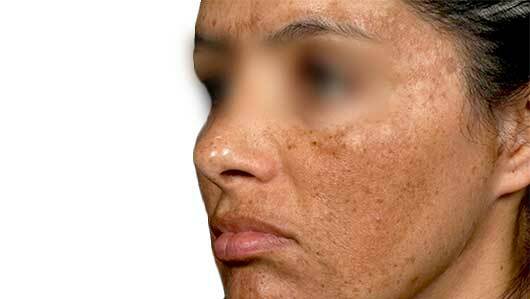 Melasma is a common skin condition of adults mostly women, in which light to dark brown patchy pigmentation develops usually on the face. Although it can affect both genders secondary to excess ultraviolet irradiation it is more common in women. It occurs in pregnancy and also can be caused or exacerbated by the oestrogen in the oral contraceptive pill. Melasma is usually very noticeable during the summer months when the face can actually appear dirty and fades a lot during the winter months. It has no cancerous potential. Proper skin care is essential in melasma. Starting the day with either an AHA or BHA cleanser that wakes up the skin cells and makes them respond better to active products. Sunscreen daily is very important. REFORM Skincare SPF30 sunscreen is a once daily factor 30 application. It has titanium dioxide which gives a complete physical block. REFORM Skincare Vitamin C 20% is a very powerful anti-oxidant and offers additional sun protection and is a whitening agent. REFORM Skincare Retinol 1% is an excellent serum for pigmentation and anti-ageing also. It also improves fine lines, pigmentation and ageing, it is not to be used in pregnancy or breast feeding. If these products are combined with a home dermaroller there is increased penetration of about one thousand into the skin so results will be superior. If the pigmentation is very severe or only improves moderately with the above, prescription products can be added in for a short period which again is excellent for increased pigmentation. Lasers can also be used including FRAXIS Co2 and Fractional RF with Needling.